Physicist, inventor, and entrepreneur Ray Milton Dolby was always interested in music. Scientifically, he was interested in the vibrations that make sound, and as the owner of a high-fidelity set and a pianist himself, he wanted audio recordings that more accurately recreated the original performance of the music. Growing up in California's Redwood City, he was the geeky teenager that adults turned to when audio-video equipment needed repairs, and after a chance meeting with local electronics manufacturer Alexander M. Poniatoff, founder of Ampex, he went to work for that electronics firm before graduating from high school. Through his college years he was part of the company's six-person team that developed the first practical video tape recorder in 1957. After Dolby earned his PhD at Cambridge, he joined UNESCO (the United Nations Educational, Scientific and Cultural Organization) and was assigned to India. There, while visiting an ashram to record sitar music, he conceived of a noise reduction system for sound recordings. His original system, developed in 1965, diminished tape hiss during audio recording by using circuitry of Dolby's design to automatically boost the amplitude of selected low-level signals, and applying opposite circuitry to restore these signals to their original volume during playback, effectively drowning out the hiss. 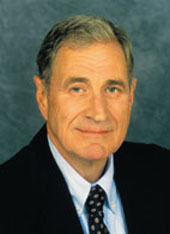 He founded Dolby Laboratories in the same year, and later worked with Henry Kloss (1929-2002) to adapt the system for use outside professional recording studios, including home, cinema, and high-definition television use. With this, the Dolby brand became a recognized symbol of quality in audio recording and reproduction. In the early 1980s, Dolby Labs took legal action against rock'n'roll star Thomas Dolby (real name: Thomas Morgan Robertson). The performer's stage name arose from being nicknamed "Dolby" by bandmates in his youth, for his mastery of Dolby-branded equipment. A common sense settlement has allowed the musician Dolby to retain his stage name, so long as he neither claimed affiliation with Dolby Labs nor attempted to market electronic or musical equipment.